Holyhead Coastguard received a phone call from a mobile on board F/V “LIZA-REMADA”. 2 persons on board, no lifejackets, flares or VHF radio. They were on passage from Rhyl to Rhos-on-Sea when the gearbox packed up. 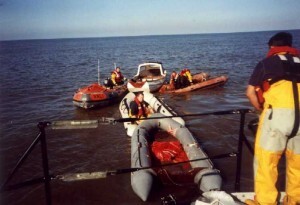 The AWB launched at 1544 and found the casualty about 1.5 miles west of the boathouse, although the crew also phoned the casualty, and the they thought the boat was off Prestatyn, to the East of the Boathouse. The boat was located at 1552 and a tow was taken up to Rhyl harbour, with the 2nd coxswain on the casualty, fixing a drogue on the casualty to help with steerage. The harbour was entered at 1617, and the casualty was safely moored up by 1631, the 2 occupants being assisted by a local boatman to the waiting Rhyl Coastguard mobile on the Yacht club slipway. The AWB returned to station by 1655. Wind W 4-5, sea 3-4. AWB put on standby to assist ILB launching to boat off Rhyl. See ILB report for more details. AWB did not launch. AWB launched to assist ILB to locate a windsurfer, reported missing ,off Llandulas beach (see also ILB report). The AWB crew spotted the surfer 1.2 miles off the beach, which was well outside the reported position of the surfer. He was intercepted and spoken to, but all was well, and he returned closer inshore. Rescue Helicopter 122 from RAF Valley was also tasked, and arrived on scene shortly after the man had been located. All units were stood down and returned to station. The Lifeboats were ready for service by 1800. Photos available. Both the ILB and AWB were launched to go to the aid of the 18ft cabin cruiser “Little Princess” which had 3 people on board and had come ashore at Pensarn beach because 1 of the persons had been seasick. The crew of the cabin cruiser were then unable to get their boat out of the surf, and the local coastguard patrol considered they were in danger. Because the boat was inside the surf line, the ILB had to go to the casualty and then take a line from the boat to the waiting AWB offshore. This was successful at the first attempt, and the AWB pulled the boat away from the surf. 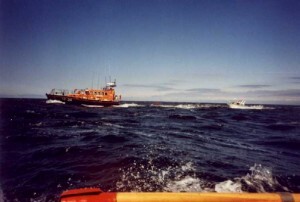 Once safe from the surf, the 2 crew of the cabin cruiser were taken on board the lifeboat and a crew member put on board. 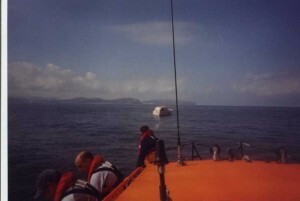 The AWB then started towing the cabin cruiser to Rhos-On-Sea, where they had started from 2 days earlier. The ILB then returned to station. It took 1.5 hours to get to Rhos, due to the sea and wind conditions, and the frailty of the cabin cruiser’s fittings. The crew were delivered to the waiting coastguard team, and checked over by an ambulance crew, but although hypothermic, were OK. The AWB crew also delivered the boat to Rhos harbour and returned to station by 1805. Both ILB and AWB launched to help the recovery of a 7-year old boy who had been recovered from the water, 1 mile north of Talacre Lighthouse. The AWB stood by as the ILB put a crewmember on board, and then both boats stood by whilst the helicopter from RAF Valley, Anglesey, winched the boy up and took him to hospital. See ILB page for fuller details. AWB launched to back up ILB to search for canoe in difficulty off Prestatyn. Search carried out for nearly 2 hours, then called off. See ILB page for further details. AWB requested by Holyhead Coastguard to launch to a person in the water off Pensarn, Abergele. The boat had just got to the water’s edge when the coastguard told the crew to stand down. Boat returned to the boathouse by 0320. Holyhead Coastguard had become concerned over the non-return of the cabin cruiser “Little Princess” which was nearly 18 hours overdue from it’s intended return time to Rhos-on-Sea. There were 2 people on board. As the AWB was going down the slipway, it was reported that the boat had been located off the Little Orme, Llandudno, still happily fishing , and unaware there was any concern for them. The AWB was stood down and returned to the boathouse by 1510. This was the same boat that the AWB had towed in on 3/6/2002 (see report and pictures above). Holyhead Coastguard requested the AWB to investigate a white speedboat with 3 persons on board off Colwyn Bay. A member of the public had been watching the boat, and it appeared to be drifting. The AWB proceeded, and had a sighting of the boat, when it started it’s engine and sped off towards Rhos-On-Sea, apparently OK. The AWB resumed it’s exercise to search for 2 dummies in the water (and we still found them!). The AWB completed it’s exercise at 2145. The 26 foot long cabin cruiser “Maxina”, with 2 persons on board, was on passage from Conwy to Liverpool when the boat developed engine problems when they were 2.5 miles north-east of Llandulas. Rhyl’s All-Weather Lifeboat launched and located the boat within 40 minutes. The owner had been unable to re-start the boat, so the Lifeboat took it in tow after putting the mechanic on board. After about 15 minutes, the mechanic was able to get the engine started, but it was running at reduced power, so the Lifeboat stopped the tow, and the boat was escorted into Rhyl harbour 1 hour later, under the mechanic’s command. 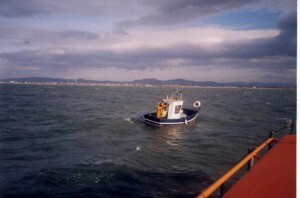 The boat was put on a safe mooring in Rhyl Harbour, and the 2 persons were transferred to Rhyl Yacht club. The Lifeboat returned to station at 1445. The crew were on exercise with relief Mersey 12-11 “Lifetime Care”. We were checking the Positions of the buoys marking the approach channel into the port of Mostyn when the Rhyl Coastguard were paged. Holyhead Coastguard also asked the lifeboat to look for a small dayboat between Prestatyn and the Wirral across the River Dee. A woman had seen this boat from the shore, and thought it was empty. We had passed a small boat of the same description on our way down to Mostyn, and the occupant was happily fishing. When the Lifeboat returned to that position, the boat had gone, and there were no other boats in the vicinity. The Rhyl coastguard mobile were asked to go to Barkby beach in Prestatyn, to check if the boat had come ashore there. They confirmed a boat had just come ashore, and this was the same boat the Lifeboat crew had seen earlier. This was the boat the woman had seen, and, as all was well, the Lifeboat returned to station at 1835. Both the ILB and AWB were launched after a member of the public telephoned Holyhead Coastguard from Pensarn beach, saying that a woman had gone into the sea , and was under the influence of alcohol, and was swimming out. The North Wales Police helicopter (NW1) and the RAF helicopter from Valley, Anglesey (Rescue 122) were also tasked, together with Rhyl Coastguard team, and a thorough search of the shoreline and up to 1 mile out was undertaken with searchlights , flares and nightsights all being used. After the coastguard had made further enquiries, the telephone where the call was made was found to be inland over the railway bridge, and after a further sweep by all units, it was suspected that the call was a hoax. Local fishermen on the beach had seen nothing as well. All units were stood down, the ILB and AWB were back at the boathouse by 0025. Both the AWB and ILB were paged, together with Rhyl and Dee coastguard teams, to assist police and North Wales police helicopter (NW1) to search for a 70-year old man who had gone missing from Presthaven Sands holiday camp, Gronant. The man had Alzheimer’s disease and had a very short attention span. He was last seen going towards the beach at 1900, and staff were very concerned about him. A major shoreline search was carried out until 2300, when the teams were called back awaiting further instructions from the North Wales police control. The RAF rescue helicopter took over just after midnight, and it is believed the man was found in the sand dunes by the camp around 0300, safe and well. The AWB was launched to assist the ILB in recovering 3 inflatables and 1 dayboat, which were tied together and drifting 1 mile out off Point of Air. The inflatables were all full of water, and all 4 boats were obviously recently used for gathering cockles, as there was still gear on board. 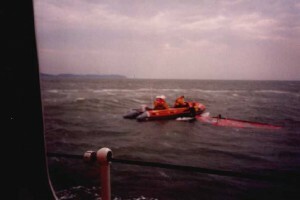 Once the inflatables were baled out, they were all towed back to Rhyl, 2 inflatables and the dayboat behind the Offshore Lifeboat; and 1 inflatable behind the ILB. The Boats returned to Rhyl by 1530, but it took another hour to get all boats and equipment back to the boathouse, as the tide was well out, and it was one of the biggest tides of the year. The owners were waiting for the crew when they got back to the boathouse, and it seems that the boats had drifted away on Thursday evening from the River Dee. It was lucky that none of the Irish ferry boats or coasters had run over them in the 3 days between. The owners retrieved their boats the next day. AWB launched to back up ILB in searching for a man who had become disorientated on the sandbanks off Presthaven Sands camp, Prestatyn . Rescue 122 (helicopter from RAF Valley) was also tasked. The Coastguard station at Holyhead were able to keep in contact with the man via his mobile phone, and as the rescue units arrived on scene, he had managed to get back to the shore at the Grand Hotel. He refused any further assistance, and all units were stood down, the lifeboats returning to station at 2025. Flint and West Kirby Inshore Lifeboats, together with D601 (trials new D-class ILB ) at West Kirby, had already launched after numerous reports were given to Liverpool Coastguard that 3 cockling boats with up to 9 people on board, were getting swamped by the incoming tide, and having difficulty returning to shore from the sandbanks of the river Dee off Mostyn docks. The AWB was tasked to assist as the ILB’s were operating at night. The Lifeboat was off Prestatyn with some 4 miles to go, when Holyhead Coastguard instructed the Coxswain to return to station. There was much confusion in the reports, and, as it was high tide, the Lifeboat remained off Prestatyn until Liverpool Coastguard reported that the coastguard team from Mostyn had found all people well and safe in Greenfield dock. The Lifeboat returned to Rhyl, but as the tide was on the slipway, went into Rhyl harbour. Once there was sufficient beach to recover, the boat returned to station, being ready for service at 2140.